Coloring Pages. 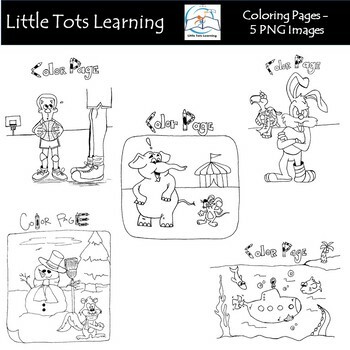 Your kiddos will enjoy coloring these pages. This set contains 5 high-quality BLACK and White Coloring Page Clip Art images. Images saved at 300dpi in PNG files. • Files come in zip format. You must know how to unzip files on your PC/Mac to retrieve them. • You will need software that supports the use of PNG files (Adobe products recommended). Personal or commercial use. Copyright remains with Little Tots Learning. This is intended for use by one teacher in one classroom. It is not to be redistributed to an entire school or district. It may not be redistributed or sold online. If you are interested in business or personal clipart, please contact me at littletotslearning1160@gmail.com. Thanks for taking the time to stop by my store!